Well, the C8 reveal is upon us in 3 months or so. I've been covering the Toyota Supra and the C8 with great interest. I decided to do an interesting comparison between the two cars. I realize, they are not really matched in price and yes, the Corvette has the advantage with raw numbers - and it costs about 25% more. With all those caveats, I still thought it would be interesting to compare the two brand new sports cars, with brand new chassis we are blessed with in 2019. It doesn't happen very often. I'm also quite curious about the camo on the Vette - especially by the air intakes. Something really odd is going on there. I'd be interested to see what you think. There's so much that's being covered up. More than I thought. The new Supra is a joke. The Supra is a quality car, but so far from what I am wanting. Thanks RevMatch for putting the two together. Once the Supra and the C8 are out side by side, we will give the Supra the price vote, call it a tie for their interiors, then IMO the remaining 10 categories will go to the Corvette. Thanks for putting this comparison together RevMatch TV. Well done and thoughtful. I agree something is 'hinky' with the C8 side vent. Note how somewhat awkwardly/gingerly Tadge opens the door. Also, that would, IMO. be a problem when the door is open for individuals (and kids) walking around/into it. Supra is model citizen in car land. It informs to compare the Supra to assumptions about the C8. Comparison informs that the 2 are very different. The only meaningful comparisons might be reliability and joy of use. Have to wait and experience reliability and joy of use over long years. It is not a verbal experiment. Thank you RevMatch. The Supra is an excellent car. However, neither its looks nor its power level appears to me. Wonderful if it makes others happy. Not a big "new" Supra fan here. I had a 85 many years ago, it was very nice and a great DD. The new design just leaves me flat. Agree the side scoop on the C8 is definitely camo'd up. Supra starts at fifty grand...corvette starts at 62 grand? my personal preference rating was..
if i remember correctly it was the early to mid 90s.. When the C5 was being designed, the Toyota Supra one of the cars it was being aspiration-ally compared to; it was literally a benchmark car for the C5 engineering team. 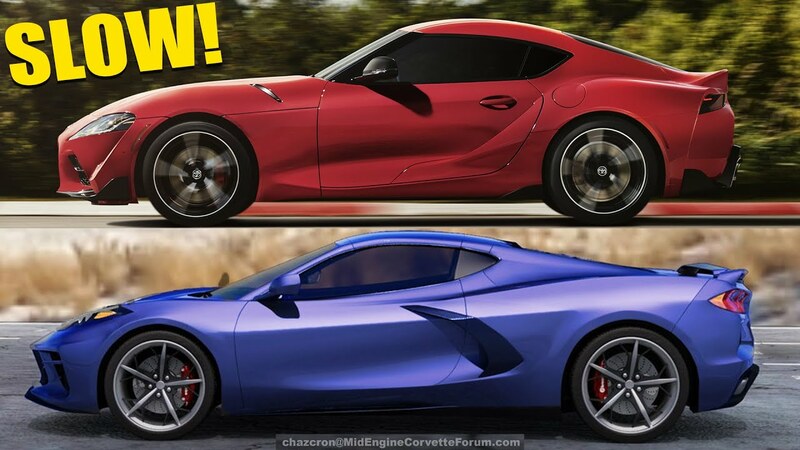 We all know that is past news and that if this new Toyota survives more than several years and they start to design a its next-gen successor, they would be hoping and designing for its performance to be 90% of the 2020 ME Corvette (but then it would be 2025 LOL). Good job comparing, but I just don't see an existing or potential Corvette customer opting to go the Supra route. I could conceivably be interested in a Supra. If it weren't so cartoonish. That's one of the worst styling jobs I've come across in a long time. I went to the Dallas Auto show only to see the Supra and thought wow the TS looks much better in person than 8 expected. I was a big Toyota fan owning the 1st and 2nd Generation MR2 and Supras. At least the Corvette ME and the new loaded Supra is closer in price than a Mclaren and a Corvette. A wise man told me it’s about feeling CONFORMABLE with your purchase choices. I can afford a 488 Ferrari but I feel more comfortable buying the new Corvette ME or a R8 and a few other cars that are not over 250k. This goes for people saying a Ferrari, Mclaren buyer will cross shop a Corvette Z or ZR1 over those higher end models. I just don’t see that happening only in isolated cases with a budget minded person. Can’t wait till see both on the road and the new ME in my garage. The showcar concept car toyota showed was a real beauty...the bmw z4 based vehicle i hate to say was quite a bit less exciting. sometimes the compromises of a concept car are worth the inconveniences..
im sure the mark v supra on the road will be a good vehicle. just not something I would ever buy..
Agree with your first line. The shapes that worked on the much longer concept just don't work on the much shorter Z4 chassis. But I think building the concept car would not be cost effective for Toyota. The shared platform is the only reason it's as (relatively) inexpensive as it is. Toyota building its own unique car would have put it out of reach of the market Toyota is aiming at. Not a lot of demand for $100,000 Toyotas, I'm afraid.